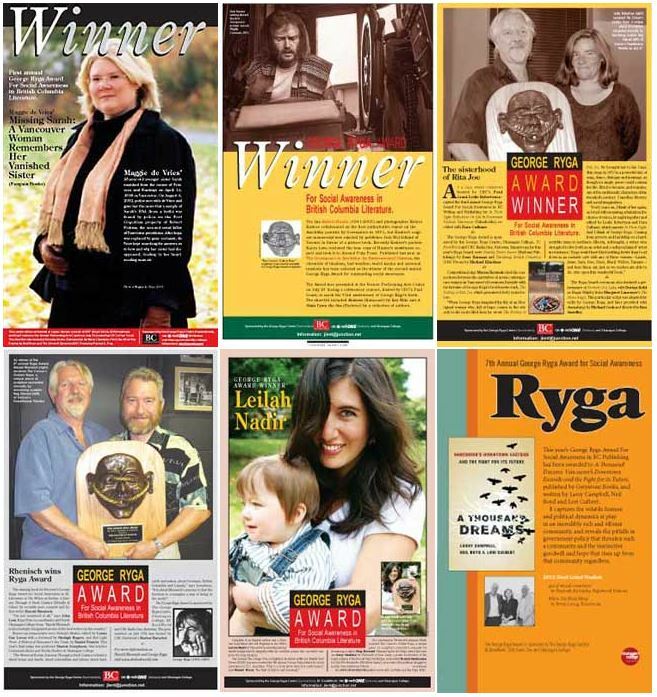 The George Ryga Award is an annual literary prize for a B.C. writer who has achieved an outstanding degree of social awareness in a new book published in the preceding calendar year. It was initiated by Alan Twigg of BC BookWorld and John Lent of Okanagan College in association with The George Ryga Society. Initially excerpts from shortlisted titles were aired on CBC Kelowna’s Daybreak Program and early winners were given a commemorative sculpture by Reg Kienast through the auspices of Ken Smedley who was managing George Ryga House in Summerland. In 2003, Vancouver writer Maggie de Vries won the first Ryga Award for her memoir Missing Sarah (Penguin Canada) about her sister who went missing on the Downtown Eastside. In 2004, The Greenpeace to Amchitka: An Environmental Odyssey (Arsenal Pulp Press) by the late Robert Hunter was selected and the award was presented to Robert Hunter’s widow during a Greenpeace crew reunion; coincidentall a musical celebration was hosted by CBC’s Paul Grant featuring P.J. Perry, Tommy Banks and Mike Lent in Vernon’s Performing Arts Centre on George Ryga’s birthday. In 2005, the winning book was In Plain Sight: Reflections On Life In Downtown Eastside Vancouver (Talonbooks), edited by Leslie Robertson and Dara Culhane. Information about subsequent winning titles is available elsewhere on this site. In 2014, when the George Ryga Society was disbanded (following the sale of George Ryga House), all management and administration responsibilities reverted to Alan Twigg in Vancouver on a volunteer basis. At this juncture B.C. BookWorld added a $2000 cash award for each winner, along with its continued provision of free publicity for each winner, and the 2014 competition attracted a record thirty-five entries.